Everything is quiet. At some point, one by one, the lights of the city went out. Unnoticed, the night noises ended and the music died. The only sound left in the artist’s studio is the quiet, almost hypnotic rhythm of a small metal weaving tool, marking time through the early hours of a new day. Energized, inspired, the artist will not sleep until morning. Larissa Nowicki’s sculptures and weavings are made of the pages of books, with and without words or images. Her artistic roots are as a designer of art books, and the pages of those books have always been her medium. They are shredded, intricately hand woven, and then manipulated and enhanced. With their loosely assembled grids and reductive forms, Nowicki’s works invoke the vocabulary of minimalism but originate from her personal and emotional experiences. The paper constructions in Insomnia reveal a new level of freedom and sophistication for the artist, incorporating various departures from her own artistic strictures. There is no longer any text on the book pages she shreds and weaves, which eliminates both the complicated graphic chaos of random words and the internal monologue they cause. In place of text the artist uses either pages of printed images, or blank book paper. There is a harmony to even the most colorful of these new works without the noise of speech. Those weavings created from unprinted paper are never static, but have vibrant, living surfaces. The largest piece in the exhibition, “The Weight of Dreams” is a 76 inch high weaving of unprinted book pages, the whole of which is minutely pierced and enhanced with silver point. This monochromatic base has a subtly reflective surface that is constantly changing as light quietly dances across its surface. All of the pieces in the exhibition are stunning textural meditations that hum rhythmically at various quiet levels, keeping their underlying cacophony in check at all times. 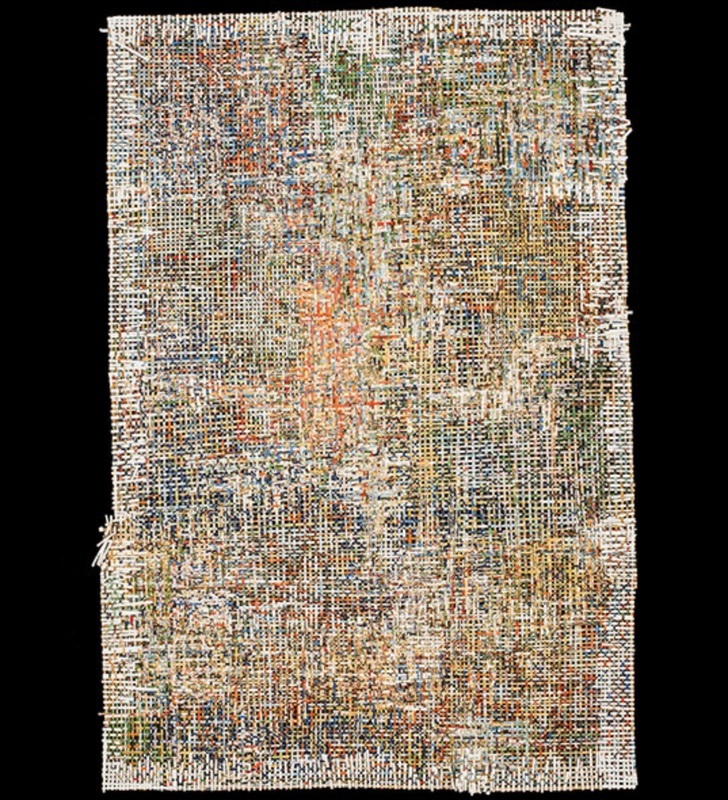 The meditative effect inherent in the repetitive process of weaving infuses the artist’s work with an extraordinary serenity , yet they reveal layers of substance and meaning that resonate long after one has walked by. Like calm imposed on any storm, the tranquility means so much more because of what lies beneath. They call to mind Zen gardens, both in origin and effect. A random path of a thousand pebbles will become a peaceful river in the right hands. As with this artist’s work, the transformation of the disparate many into the meditative whole is magical. Larissa Nowicki was born in 1972 and is a native New Yorker. She is a graduate of the Royal College of Art and Rhode Island School of Design. Her work is can be found in public and private collections, in the U.S. and abroad. She was recently awarded her second residency at the prestigious Josef & Anni Albers Foundation in Bethany Connecticut, and was the winner of Pulse Miami prize in 2011.